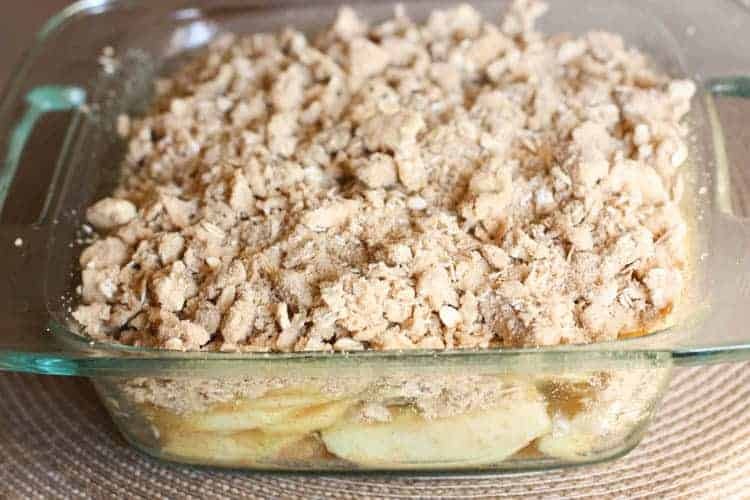 The BEST Apple Crisp recipe ever is made with thinly sliced Granny Smith apples and baked with a cinnamon glaze and oatmeal crumb topping. 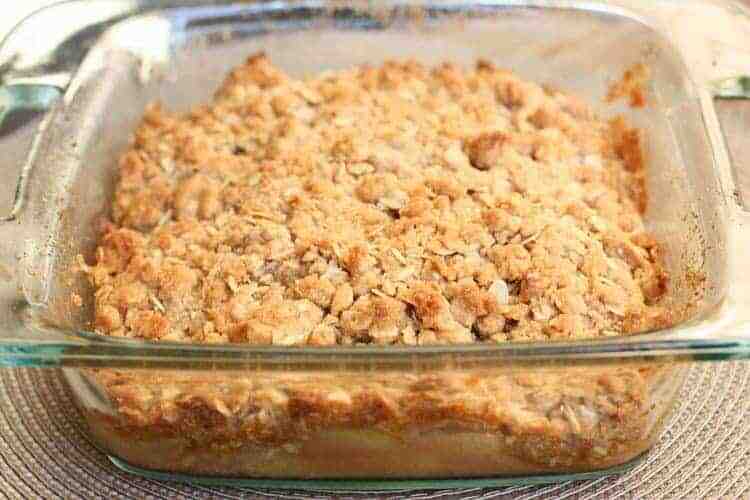 Apple Crisp is one of those recipes that a lot of people have in their personal recipe book. Let me just say, if you do already have a recipe for apple crisp, you will probably never make it again after trying this one! 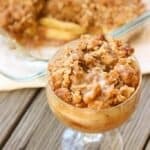 Best apples for apple crisp? Granny Smith apples are my favorite for using with apple crisp. They bring a tart, sour flavor and crisp texture that blends so well with the sweet oat crumble topping. In general, they are all-around baking apple. If you don’t have Granny Smith apples, Gala apples, Honeycrisp, Golden Delicious, or any tart apple with work great! Should I peel apples for apple crisp? Yes! For apple crisp I like to peel my apples before baking them. The skin doesn’t break down during baking and can make for a tougher texture. I use my Johnny Apple Peeler for this part because it does the work for me. It PEELS, CORES and SLICES the apple all at once! I once made this apple crisp for a party of 200 people and the Johnny apple peeler was a life saver. 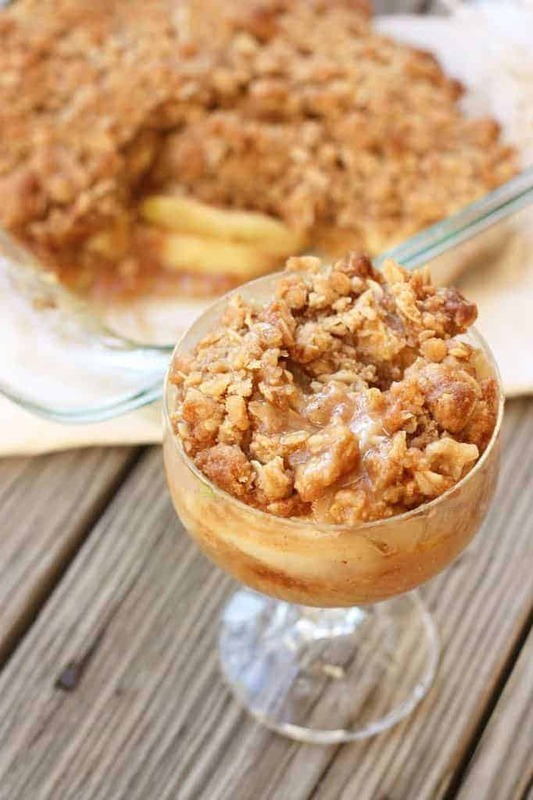 Are apple crisp and apple crumble the same thing? Generally, yes. Both dishes refer to baked, sliced apples that are topped with a sweet crumble topping. Start by making the oat crumble topping. In a medium size bowl combine the crumb topping ingredients with a fork or pastry blender until it resembles small crumbs. Refrigerate. Next, peel and slice your apples. I use a Johnny Apple Peeler to peel and slice the apples all at once. It makes the process a lot faster! Once the apple are peeled, add the melted butter and flour to a small bowl and combine. Add lemon juice, milk and vanilla and stir well. Stir in brown sugar, cinnamon, and salt. Next, toss the apples in a cinnamon spice sauce. The sauce has lemon juice in it to help keep the apples from browning, and a splash of milk that adds creaminess to the sauce that I love. Pour the apples into an 8×8” baking dish. (This recipe can easily be doubled and cooked in a 9×13” pan). Sprinkle the crumble topping over the top of the apples. When you make the crumble topping, be sure to cut the butter in really well. I sometimes use my fingers to do this because it’s faster and easier to tell if the butter is crumbled into the topping really well. Place the pan in the oven to bake for about about 30 minutes, or until the topping is golden brown. Definitely allow the baked apple apple crisp to rest and cool for at least 10-15 minutes before serving. That will give the sauce a chance to thicken a little more as it cools. You do not need to cover the apple crisp while it bakes! If for some reason it started to get overly brown, you could cover it with tinfoil until it finishes baking. I have not had this problem! Serve with a scoop of vanilla ice cream and a drizzle of caramel sauce, if desired. Complete HEAVEN! Can I make Apple Crisp ahead of time? Make the apple filling, adding a tiny bit more lemon juice so the apples don’t brown. Store the apple filling in an air-tight container, in the fridge, for up to one day. Make the crumble topping and put it in a separate ziplock bag, in the fridge. When ready to bake, remove from the fridge, and sprinkle the topping on top. Bake as directed. Can I freeze apple crisp? Prepare and bake the apple crisp as directed. Cool the crisp completely, then cover it with a double layer of aluminum foil. Freeze for up to 3 months. Thaw overnight in the refrigerator, then warm in a 350°F oven for 20-25 minutes or until heated through. This recipe works great prepared a day in advance, or you can freeze it, as well. See my notes at the bottom of the recipe. Pour butter mixture over apples and toss to coat. 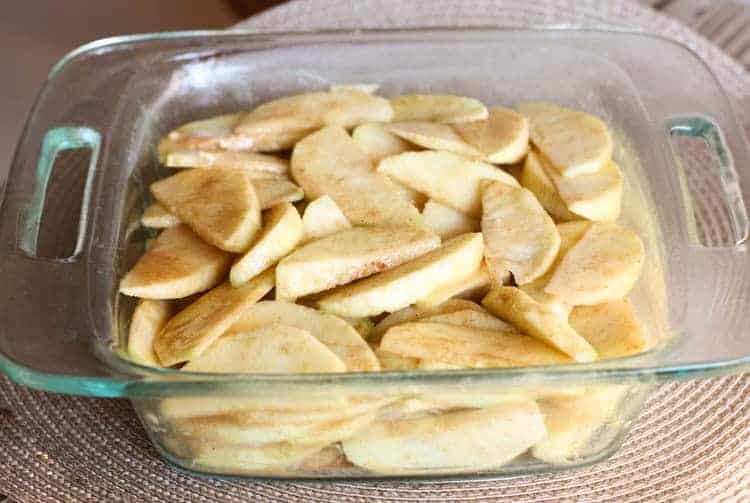 Pour apple mixture into an 8x8-inch baking dish and spread into an even layer. 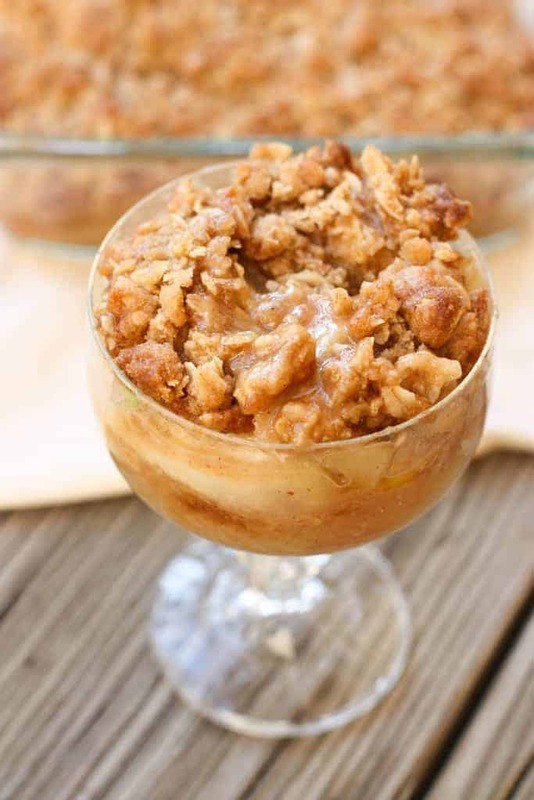 or try Caramel Pecan Apple Crisp! I originally shared this post October 10, 2014. I updated and republished it on November 3, 2017. *This post contains affiliate links. I like to share my favorite products with you! Love this recipe! Have made it a couple of times. Want your home to smell wonderful and offer a tasty dessert to guests. I highly recommend this recipe!! Doubled it and baked it in a 13×9 dish, so we had left overs to share!! I love love love this apple crisp!!!! Made it a dozen times. Love it each time. i have omitted the lemon juice at times, just because I didn’t have it on hand and it’s still amazing. I always use Granny Smith apples. It’s perfect each time. It was the perfect dessert on a cold rainy day. It’s going into my permanent file. While some need ice cream to round it out, this is amazing on its own. SO if you don’t have, no worries it can stand by itself and still be scrumptious! Fantastic ….quick, easy, and DELICIOUS! I will use this recipe often.